What would you do if you encountered some green, sweet peppers, but they arrived looking like the peppers in the above image? I don’t think anyone would disagree that the appearance is definitely affected. I would bet if these peppers were on display in a store the consumers would select the green sweet peppers first, bypassing the peppers with the black discoloration. So, I have asked a lot of questions, but what is the answer? Is the black discoloration a defect for the U.S. No. 1 Grade? The USDA says “No.” Let’s look at this a little further. If a green sweet pepper shows a trace of red, the pepper is scored as a defect, as Turning Red. If the sweet pepper shows sunburn, affecting more than 15% of the surface, the pepper is scored as a defect. But if the black color affects a pepper it is never scored as a defect. 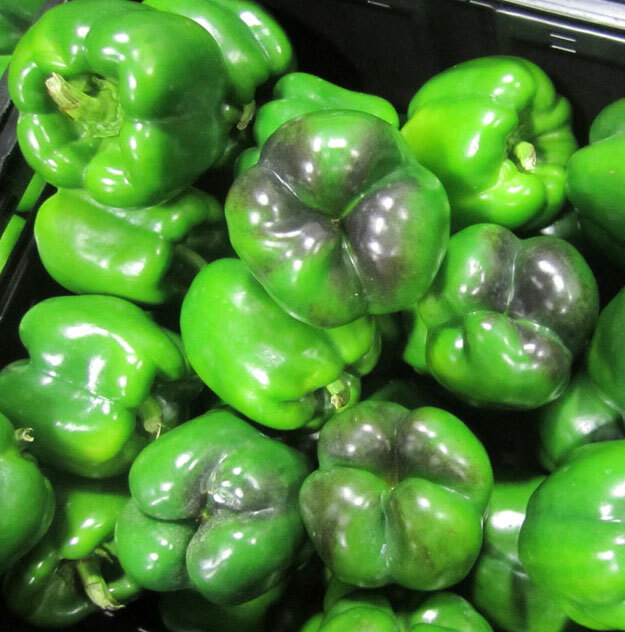 What if the black discoloration affected over 50% of the surface of the sweet pepper? Still not a defect. Cut and dry, the black discoloration is never scored as a defect. I realize the black discoloration does not lead to decay, does not affect the flavor of the pepper, but I am not convinced the black discoloration does not affect the marketability of the sweet peppers. I’d love to hear your thoughts, should the black discoloration be a defect if the area affected is greater than 15% (scoring guideline for sunburn), 25%, 33%, etc? It is nowhere near as prevalent as it seemed to be 20 years ago as I think newer varieties are less susceptible to this problem. But Silvery White Discoloration was not a big problem until the past 10 years or so and we see a lot more of this defect than the black discoloration. Having said that, you would think the dark discoloration, if it were scoreable, would be scored more strictly than SWD (10%/25%). Certainly it would not be scored any less strictly than SWD. you have a very valid point. Silvery white discoloration is not as near an eyesore as the black discoloration is. We were told by one of our suppliers that the industry term for this is Blue Nose and it is caused by cold temperatures.